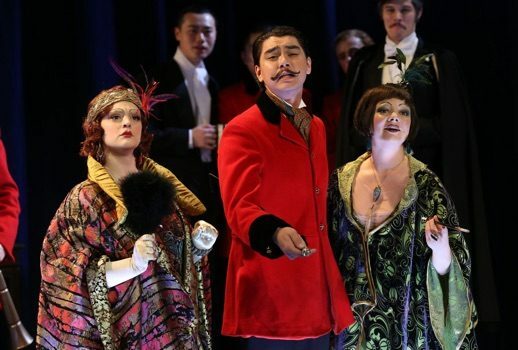 Forgotten operas when revived may prove to be only their own reward. But if an opera was a hit in 1810 and circulated Europe for decades, even reaching New York in 1827 (in those days, not technically part of Europe), then it must be of some quality, right? However, not even the most optimistic can have expected Nicholas Isouard’s Cendrillon to be quite such a treat as it proved Friday night, in the first of four performances given by the Manhattan School of Music at Florence Gould Hall. There are two casts, and I’m tempted to sneak back to catch the second—but really to hear those tunes again. You should try to catch it even if you’re not into operas by forgotten composers. In case you’re into treat-filled evenings. Isouard, born in Malta in 1773, left the island for Paris just before the English took it over in 1800. In the following two decades, he earned some celebrity composing more than forty opéra-comiques. He wrote a Barber of Seville and a Cinderella (Cendrillon) that vanished when Rossini showed up, operettas based on incidents in the lives of Michelangelo, Lully and Cimarosa, Orientalist fantasies (very chic after Bonaparte invaded Egypt), village romances, all of it. From Cendrillon, as Manhattan School has reconstructed it from confusing manuscripts, we find that Isouard had a talent for tunes, both lighthearted and sentimental, with cheerful openings and beautifully contrasting minor sections. The stepsisters each get to declaim a parody of a grand heroic aria. There are also duets, a pretty one for the Prince and his tutor, and a grand comic one for the stepsisters, who are overcome with rival passions for the Prince they have not yet met. The version of the story that Isouard’s librettist devised will be familiar to anyone acquainted with Rossini’s opera. There is no stepmother but a stepfather, the Baron, with daughters named Tisbé and Clorinde. There is no fairy godmother; just the prince’s tutor, Alidor. The prince has changed clothes with his valet, Dandini, who works it and flirts it. Everything in Isouard follows the Rossini pattern except that we get the traditional missing slipper (that only fits Cendrillon) instead of Rossini’s bracelets, and the detail that the Prince’s late father decreed he must marry by a certain date. Today. Abigail Shapiro, Tisbé, is so fierce in her lurk-about through the ballroom that one might not notice the exceptional size and quality of her voice, its evenness in her big three-movement solo of comic despair. Hyeree Shin, Clorinde, is less conspiratorial, but her manic bolero (of all things) to charm the Prince is so amusing that you might miss the sheen and brilliance of her soprano. Both ladies deserve vocal attention on some occasion when they are not wrestling on the ballroom floor. In contrast, Amanda Austin, the Cendrillon, has a pretty voice and no grand showpiece to display it. Is this the producer’s idea or Isouard’s? Michael St. Peter sang the Prince, and Isouard has given him couplets, just the sort of light, elegant, aristocratic air that suits a prince in love in any French opera. He delivered it with grace and liquid tone that aroused considerable enthusiasm. His duet with the suave baritone of Marcel Sokalski, as Alidor, was another high point of the evening. William Huyler sang the Baron and Marshall Morrow Dandini, the make-believe Prince, and both were so funny that one regretted the lack of a buffo duet such as Rossini bestowed. Again: Are they similarly small parts in Isouard’s score, or was this a production decision, keeping the occasion brief? It would affect this worthy score’s possibilities for popular circulation, of which it is worthy. These two guys should have more to do. Maybe someone could translate Rossini into French. The stylishness of French light opera and a deft orchestration make works like this ideal for music school forces—the students can learn a lot and no voices will be damaged. Conductor Pierre Vallet and a couple of assistants have put the piece together neatly, with a brief, charming overture that depended on byplay for harp and horn. Dona D. Vaughn directed the swiftly-paced forces and is, no doubt, to be credited for giving the stepsisters every encouragement to prowl and preen. Tracy Dorman is evidently responsible for the madly colorful costumes in the style of The Boy Friend. She gets points from me for Clorinde’s wacky hat and Tisbé’s furry feathered fan, but all of it looks deliciously eccentric. This is a special occasion.